4. Transfer the dough at 15℃ , and rest for 16-18 hours. * She put the dough in a refrigerator to keep the dough temperature down. If she keeps the dough at 15℃, the dough will be ready in 12 hours. I have tried her baguettes about 10 times so far. Although I am not successful yet. I hope that I am able to get close to her baguettes soon. This is the one that is my best one so far. 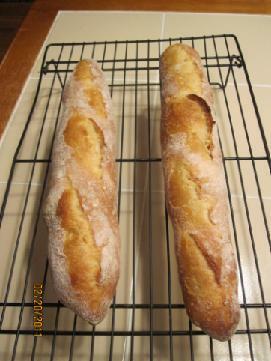 I made 2 baguttes. I bent the dough when I transfered it into the oven. You can see the black spots in the crumb because I used alcoholic raisin from the raisin yeast water. Aki doesn't use them. I just punched it down once before I put the dough in the place at 14℃。 And I divided it in two after 24 hours ( yes, it took for a long time until the dough was doubled that was actually tripled! I realized it after I found Juergen's exprement http://tfl.thefreshloaf.com/node/22228/test-tube-baking-2-bulk-fermentation-doubling-size Thank you, Juergen) Then I did a letter fold then took a bench time for 30 minutes, and I hit the dough onto the work bench twice and I did fold 1/3 from the bottome line, then I pinched the top and bottom sides and closed the seam very well, and I took 30 minutes for proof. Preheat 470F for 1 hour, using Syvia's steaming method and bake it at 470F for 7 minutes with the steam, and take the steaming towels and pan after that, decreased down to 450F and bake more 3 more minutes, then I took the baking sheets out of the baguettes then baked 10 more minutes at 450F. Shut off the oven then left them in the oven for 5 more minutes. I waited the dough until doubled. It came out denser than the above. I degased fliping the dough twice. 1. Poolish ( Let it ferment until doubled) I preferment the yeast and the water for 15 -20 minutes before mixing all the ingredients. 7. Divide in two: 1) A letter fold or 2) Degas: hitting the dough on the work surface 2.3 times and make a rectangle shape. 8. Bench time 30 minutes at about 23℃. 2) 1/3 fold from the bottom, if you can fold it again toward to the middle.--- Pinch the both side and close the seam very well. 11．Bake : Preheat 470F for 1 hour : Bake at 470F with steam ( Sylvia's steaming method) for 7 minutes --- Take the steaming out-- decrease down to 450F and bake 3 more minutes - Take the parchment paper out --- bake more 10 minutes --- Shut off the oven and leave it in the oven for 5 minutes. These are that I didn't degas a lot, just little. Left: (2) version Right(1) version I took 30 minutes for proof. The taste was awesome. But I took almost 1 hour for proof.. Left:Shorter one - (1) version / Right: Longer one - (2) version. 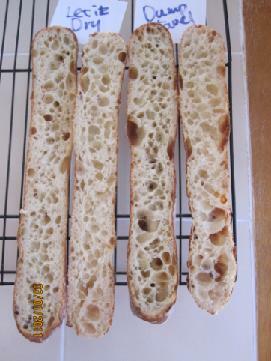 These reminds me of Juergen's experiment: http://www.thefreshloaf.com/node/22065/test-tube-baking-1-continued-white-french-bread-overproof Yes, they are over proofed.. I also thank Eric who examine an excellent job on Juergen's post. They didn't taste good because of the over proofed. The bad thing was that I had to drag when I scored because the dough was really soft. 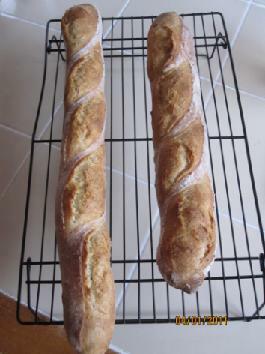 Now, I am going to test that the one is little degas and the other is degas a lot..
2/20/2011 I couldn't bake my 2 baguettes to compare the test above. 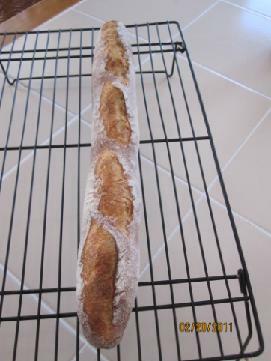 But I baked Aki's baguette in the morning. 1:00pm -- Moved the dough in the basement at 14℃. 1. dough temp should be warmer before shaping to get the airy crumb or wait until the dough tripled. 3. How to score it straightly without dragging. -------------- I used to put some shortening on the lame before scoring. I better try it again to see how it works. Water (16℃) 100g ( I recommend to use less water around 94g water ) Now, I am testing to use 68% hydartion 3/2/2011 Because I want firm strong gluten in the dough as same as Aki's baguette. 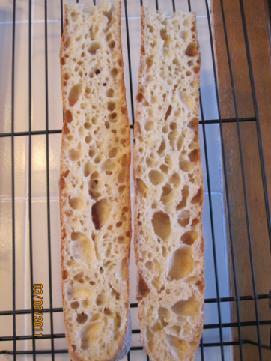 68% hydaration is the same firmness as 74-75% high hydration baguettes with natural yeast in my opinion. 1. 2/19 Punch down every 30 minutes. 4. 2/22 Divide ( The actual dough weight was 408g I divided it 204g each. The dough rose doubled. Left: Degas a lot : Flipping over twice and slapped the dough a lot. Right Gentle degas : Just little pat to make a rectangle to shape. Right Version 2 (Started to make a rectangle shape to flatten) with gentle degas. * My lame was without the chop stick. I was holding it by my left hand. I didn't put shortening on it. These are on the left one. I cut it when it was still hot. My husband and my dogs were eating it when I saw them. So, I cut the other one when it was still warm. My son and daguther wanted to eat, too. Thank you for reading, everybody! 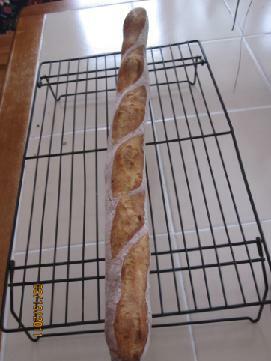 I got a book that AKi learned how to make the amazing baguettes from yesterday. I can't tell everything of the method unfortunetely. Luckly, You are able to see how to shape the dough on the sample of the book!! I prooved at 26℃ with dump towels. I still test about this. But I think "With dump towel" make thin and crispy crust? It have more big holes when I proof it at colder place? I don't know.. I just keep testing..
About taste: That is absolutely amazing. I made 68% hydration of my poolish baguette today. 1. Mix the poolish ingredients ( DDT was 65F /18.3℃) Fermented at 76F/24.4℃ for about 15 hours. 5.Bulk fermentation: 2.5 hours at 78.8F/26℃ until doubled ( If you want light and softer crumb, you better let it rise at 82F/28℃, the time will be shorten) DT was 70F/21℃ when it is doubled. 6.Put the dough in a refrigerator ( the temperature was 6℃)for 5 hours. DT was 48F/8.8℃ when I took it out of the refrigerator. 8.Shape folding 1/3 fold from the top side, lift the other side to cover that I already feld. Pinched very well. DT was 65F/18.3℃ when I was about to shape. 9.Proof : 30 minutes at 70F/21℃. I put the dough in a gabage bag to avoid to get dry. ------------->Take the parchment paper and bake 10 more minutes-------> Shut off the oven left it in the oven for 3 minutes. 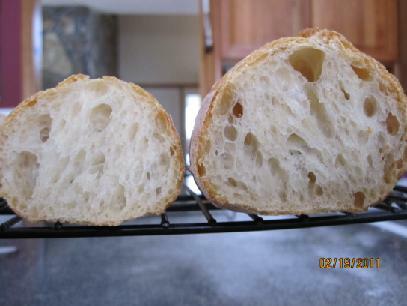 3/3/2011 Next day: The crust and crumb are much better. 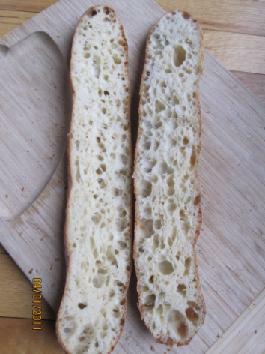 The top's crumb is better texture than the bottom. The bottom's crumb was little wetter when I chewed it. I will make 68% hydration again, next time I will frement the dough at 28-30℃ around and let it rest at 10℃ for overnight or less. 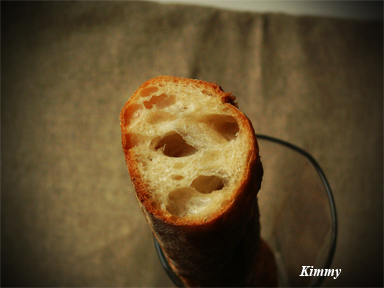 I changed a little bit of Aki's method, but I finally could manage 10% raisin yeast baguette. 2. S&F x2 every 30 minutes ( I did in the air with my hands) ( DT was 70F both after the S&F)--Rest at roomtemperature was 26-28℃ /78.8F-82F for 4.5 hours until the dough is little flat and the surface is slightly bumpy. 5. I put the dough on the floured wood board very gently. The bottom is face now. 12 Prepare the steaming towels ( Sylvia's steaming method), Scroing, then bake. This is my way.. You can make up other ideas to score the same depth each lines. 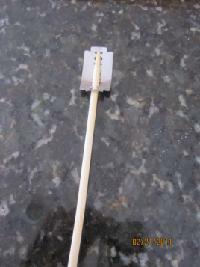 I recommend you to use bamboo skewers to detamine the length ( probably 10-11.5cm? )and make a mark with a tooth pick or so. --This is from the book. How do you slice when you score the dough? I found out that I can score very straight when I use No.1 way. My cookpad friend suggested me the way. That is very helpful.. 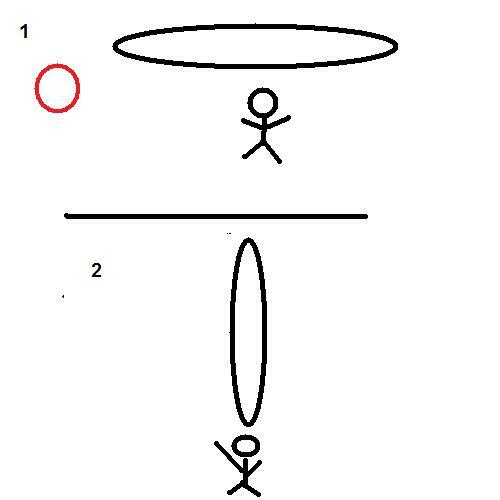 I don't think that my way fit everybody but, It may help some TFL members. Here is the best crumb that I got on 27th. 4:40pm: Mix all the ingredients except the salt--- Autolize for 10 minutes--- add the salt -- mixing by hand for 2 minutes. 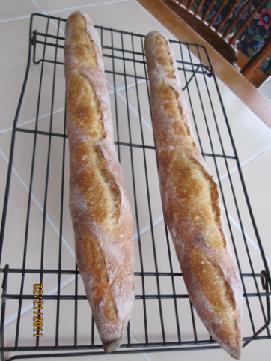 Those are some very nice looking baguettes Akiko, thank you for sharing. The formulas and procedures look easy enough to follow, it must just come down to having a great handling and care for the dough as you have demonstrated! Thank you, arlo!! I have practiced making baguettes for 10 months seriously. 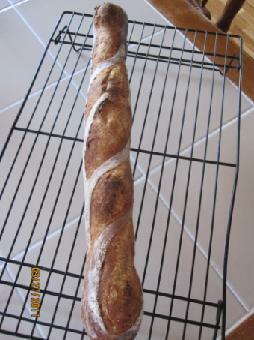 I am going to make baguettes over and over until I get close to hers! :) Fun! 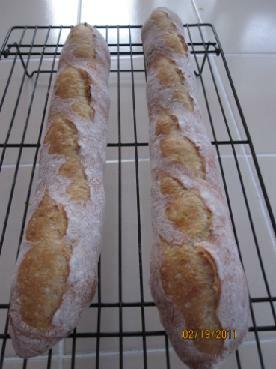 Those are beautiful baguettes, Akiko! What weight are you scaling your baguettes at? Thanks for such a thorough posting. 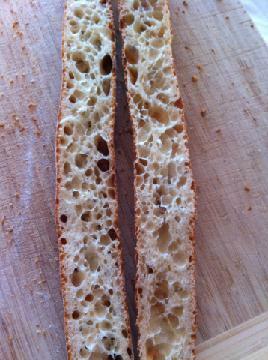 I think a very small amount of yeast and long proofing times are key to flavour and openness of crumb. Thank you for your compliment and your great opinion that is really right, Syd! What weight are you scaling your baguettes at? Does it mean that the weight before dividing? I don't put the dough on the scale to divide. I just cut it in a half by my sight using a dough cutter because the dough is so wet and I don't want to damage the dough. Your question gave me an idea. May be the dough wont be damaged if I used version (1) 3 folds ( a letter fold) - bench - degas-shape... I will try it tomorrow. You' re welcome Akiko! Sorry, I ddn't make myself clear. 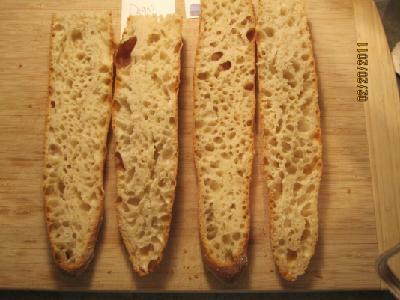 :( I meant the weight of each baguette after dividing. But now I feel foolish for asking because I could have worked it out without myself. 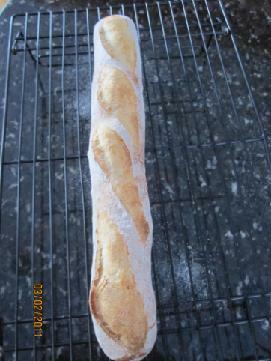 Your final dough weight is 453.8g and you made two baguettes, so that means each baguette is approximately 225g each. Am I right? Thank you for calculating for me , Syd! Yes, you are right. I thought you were asking about the actual weight of the dough. but you gave me the good idea! I weighed the dough and the total weigh was 425g, then I divided it 212.5 g each. 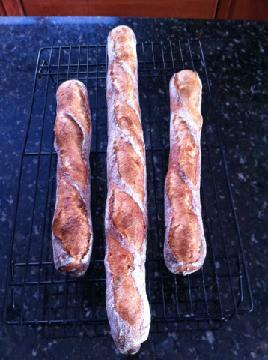 Very nice Baguettes Akiko. The yeast water method is interesting and you seem to have mastered it. Thank you for your thoughtful words, Eric! 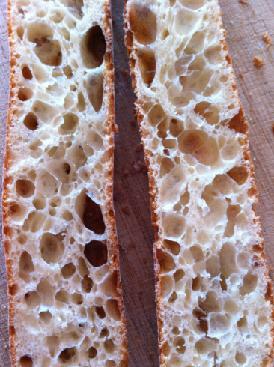 Amazingly open crumb! I will study the formula for sure, thanks for sharing! Your welcome, Txfarmer! I am sure that you will figure it out!! You and Aki are my goal! I am looking forward to seeing your result! really beautiful; strawberry & raisin water? 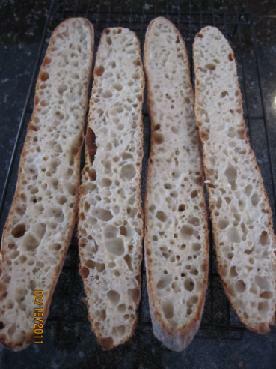 Really gorgeous baguettes, thanks for sharing your info and this recipe! Can you clarify about the strawberry water and the raisin water, are these starters? I checked Aki's web site but I was unable to find a better explanation about how these are made. 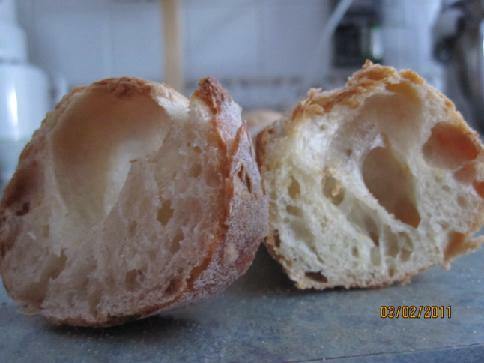 Akiko, how does the taste compare to regular ones (without fruit yeast)? 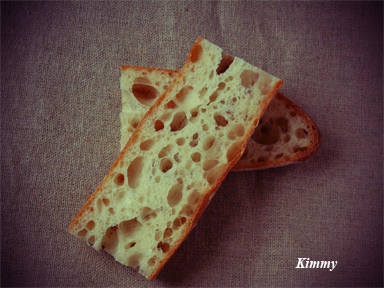 I edited 2/24/2011 I am telling you that this is based on the same hydration each baguettes when I make.--- The crust is thinner than sourdough baguettes, thicker than commercail yeast baguettes. 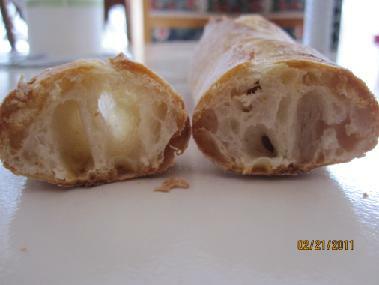 Aki's baguettes has milder sweet in it. 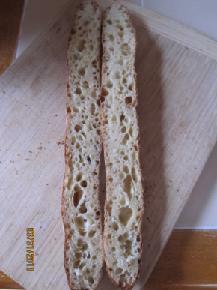 It is wonderfully tasty and thin but hard and very crispy crust that I am very pleased with. I don't smell the raisin flavor, I don't recognize it because the raisin has not strong smells, but Aki mentioned that she smells strawberry in the baguettes. Once, I made her strawberry baguettes, I did smell it too. It was really great although I was not successful. I taste very mild sweet flavor in the baguettes, and the crust is thinner than sourdough baguettes, thicker than commercail yeast baguettes. still in the dark about the "fruit yeasts" mentioned here, can someone please explain? I am sorry that you are still in the dark, Cranbo. I will ask Ron and Daisy and Karin to get you understand well. What a crumb, Akiko, beautiful. I will try your formula as soon as possible. I will say try yeast 1-2g as to 125g All purpose flour. Now, I recommend all of you guys to try 74-76 % hydration instead of 80%. The big point is that let the dough ferment fully. 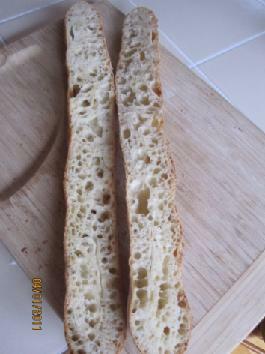 ( the bulk fermentation) Otherwise, you will have dense heavy baguettes. Hi, I had some success with the recipe I started off with - letting it bulk-ferment for 4 hours instead of the proposed 1 hour. I feel I am on track now. I set a jar with water, raisins and Pai Mu Tan tea leaves aside... another test for my patience! It sounds great and the great crumb and crust Juergen!! It sounds great, Juergen!! Please ask us if you have a queston about yeast water. My pot of raisins just didn't start to ferment. I then checked the package to find that they were coated in sunflour oil! I'm going on holiday, and further experiments will have to wait until my return. MY,,, Sorry to hear that, Juergen. Even if they are not organic, They will be fermented. but not the one are not coated with oil. I agree with your opinion. I hope you can enjoy your vacation! I am watching this video over and over and over. This is really great video! When I feel that I am diappointed in my baguettes, I always watch this video. I had a great vacation and have been back for over a week now. I followed the events in Japan with great worry, and I am glad to hear your friends and relatives are safe. My wife has lived in Japan for a while and has frends there, too. I have started strawberry water, and it looks good so far. I'll try it out tomorrow or on wednesday. I am glad to hear that you had a great vacation! I am looking forward to seeing your another experiment and strawberry yeast water!! YAY! Luckily our friends are safe and well. One had travelled up north and couldn't return to Tokyo as planned, but she was very calm about that. The power stations are really the big concern. Things seem to be improving. I trust the workers on the Fokoshima plant that they do their best. About the strawbery yeast: It got really frothy yesterday night, so I made a poolish, which has well risen and smells very aromatic and alcoholicky this morning. 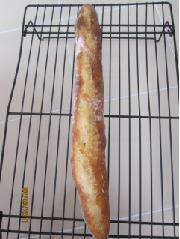 I shall have some strawbaerry baguette by this evening! I am so glad to hear that your wife's friends are safe and well. It is really heartbreaking to think about it if they are safe or not. :) I hope your strawberry baguette goes well! 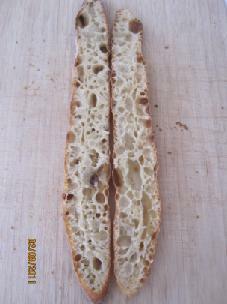 I baked the overnight baguette with raisin yeast just right now. That is my favorite baguette now. The strawberries bubbled nicely, but I didn't have time for experiments and shopping, so I used the starwberry water to seed some raisin water. But I think I got the very basics of fruit yeasts and will continue to experiment. Thanks again for your curiosity and support. 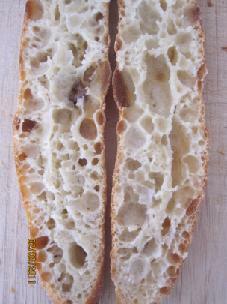 The crumb looks nicely open and tasty and shiny, Juregen! !Sometimes, I burn my bread, too. I scrape the crust that is burned with knife when I burn my bread, However, it is a sad moment to see the thing... I am sorry, Juregen. Could you eat it? I'd like to see your another experiment, Juregen! It was quite severely burnt, what I could taste of the crumb was a very soft and sweetish taste. As you might know I was on a course on Friday and am mentally digesting what I have learnt. We made breads with 5 different preferments, my family like the pugliese bread with biga best (I had to cut it warm for the photo). That's probably what I will mainly do for the next couple of weeks or so. Your new baguette looks amazing! Wow, That is very appealing to me, Juergen. No wonder you family wanted to eat more of it!! Although it is little difficult to get your formula and method. You better create your own post on baker blog. 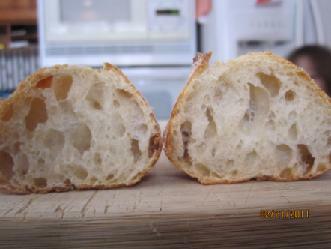 I don't want to bother you, but it is really looking great pugliese bread with biga. I never have tried pugliese honestly. Hmmm.. It really looks YUMMY. Seeing all these posts about how airy a loaf turns out makes me wonder if it's worth it if it doesn't taste great. What exactly is the purpose of an airy crumb anyway? Just to look good? Sorry for my ignorance. I've had great success with VanOver's recipe for years now. 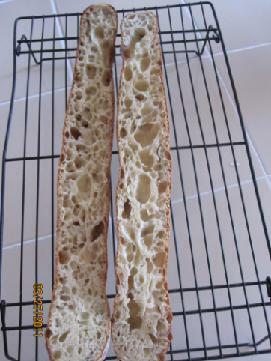 About the taste: It is not a taste less cracker baguette that I bought at the bakery shop here. 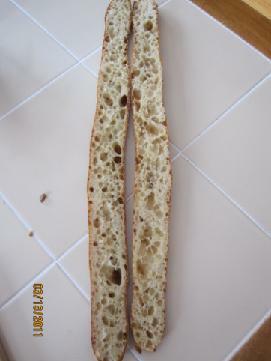 The baguette looked exactly like Aki's. but it was a totally no taste baguette. 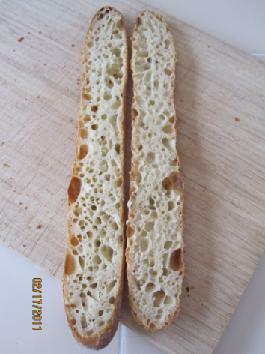 Aki's baguette: The crust is very crunchy but thin, the crumb is very moist and I can also taste chewy taste in the crumb because I let the dough rise in the colder place for a long time. I like light baguettes like I like pizzas have light crumb. This is the same reason that I prefer light airy crumb. Which one do you like bread pizzas or crispy pizzas? 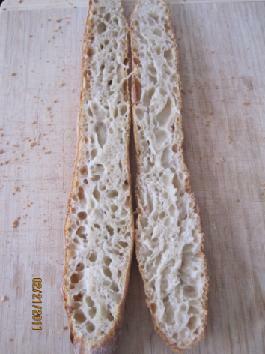 It is similar to describe about this baguettes. Charles VanOver wrote a book about making bread using *gasp* a food processor! I'll try to find some pictures I've taken of some of the loaves I've baked using it. Sometimes, I use a food prosessor to kead to strength the gluten. but it was just a short time. I think that Peter Reinhart mentions about it on his book, too. I found this on my computer. Maybe I'll fire up another batch soon to get a better view. I finally tried "My best ever baguette" today. I really like the idea of using wheat Germ that give more flavor. However, I should have waited until doubled for the bulkfermentation.I let the dough rest only 1.5 times in bulk. The crust was crunchy and thick. 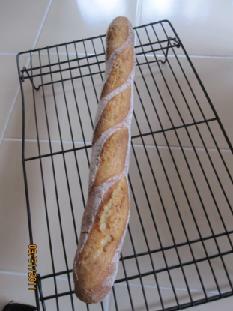 I thought it is the traditional french bread because there is completely no oil in the dough. I don't know why the crumb was little dry.. Your crumb looks fine. Did you use some oil in the container before you put the dough in? I want to try again. I pretty much follow the recipe to the letter. The only variation I use is described on page 54; "For a Lighter, Fluffier Bread". I stop the kneading process after 20 seconds and let it sit for 5 to 10 minutes, then continue for another 25 seconds. I have a very nice Thermapen instant-read thermometer that makes my job that much easier, as it seems very important to achieve the correct temp using the food processor. I have an old Cuisinart 11 cup with paddle switches. As for the doubling in bulk, I've never really worried about that because Van Over doesn't seem to think it's important. THank you for taking the time to write up for me, Billybob! I have a 10 cup Cuisinart food processor with paddle witches too. That is a christmas gift a couple years ago. 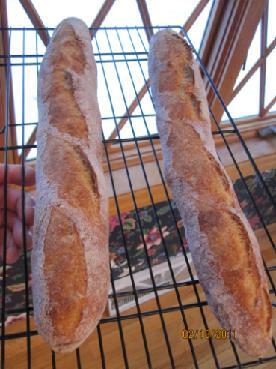 I made 2 baguettes of Van over's "my best ever baguette". But I wanted to compare the taste using 2 different methods. One is Van over's FP mixing method. 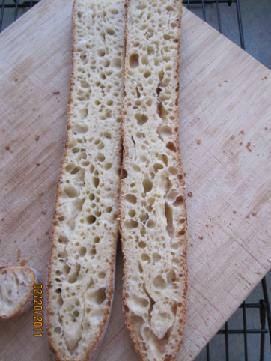 the other one is what I make for overnight baguette with raisin yeast. Left:DDT70F S&F twice interval 20 minutes, Bulkfermentation 2 hours including S&F time at 78-80F. Rest at 50-54F for 7 hours. Some oil used. 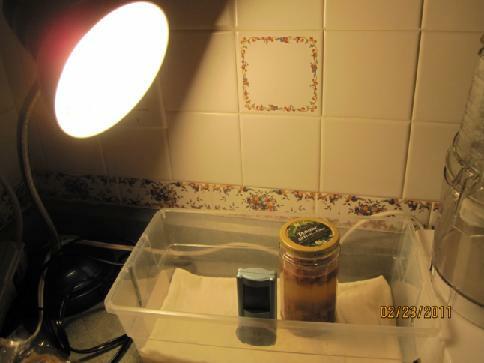 Right: Van Over's way FP method- FP 20 second / rest 20 minutes/ FP 20 seconds DDT 80F --- Bulkfermentation 3 hours at 70F-- Rest at 50-54F for 6 hours. No oil used. Both of two rose doubled. This is DDT70 and S&F way. I could shape long and thin. 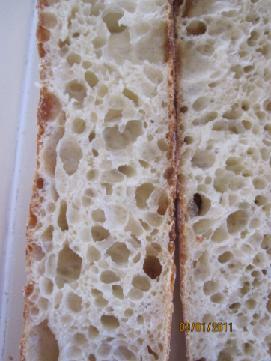 The crumb is moist and sweet and chewy pleansantly. I couldn't shape any longer because the gluten was develped a lot in the dough. The taste was little drier ( the last one that I made was much drier. Thank you for your advice. ),less sweeter and softer crumb compare to the other one. 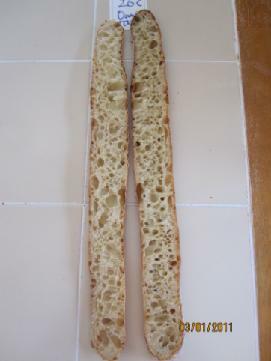 I was surprised to see a lot of holes in the baguette. It will be good go with a sandwich though. Have you ever tried the method of hand mixing and S&F? I think that it has more flavor to be honest. I better try the recipe! Thank you for the picture with THE BOOK! :) I may be able to borrow it from the library.... There are a lot of air around the crust, too. They look awesome! Thank you, Billybob! I will study more baguettes! "Now, I realize that I don't want to let the dough rest below 50F/10℃ anymore..."
Could you please explain why? Thanks! This is from all my expreiment, Yippee. When I retard all my bread around 50F/10℃ ( levain bread for 5-6 hours, Aki and my baguettes for 12 hours around), it tastes better. 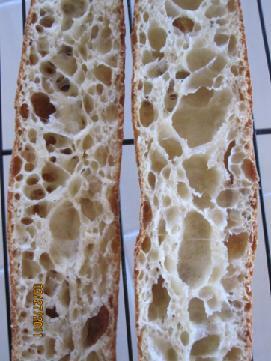 ( No bland taste ( fresh), Crumb is very shiny) Especially the crust is thin but very crispy. When I retarded some breads in a refrigerator (6℃) for overnight even I put some oil on the dough not to dry, the crust were much thicker and harder and the taste were sweetless. Retarding the final dough in a refrigerator for 5 hours yesterday, the crumb looked like dead crumb ( it was not shiny) that is what I really didn't like. If I retarded the final dough again, I would take 8-12 hours, the crumb would be shiny..but taste less compare to fresh bread. This is all my thought... I may be wrong.. Please tell me if you found out some thing new about retarder! You are studying very well! It's nothing when compared to your persistent, in-depth 'research'. Thanks for all the valuable information that you've been sharing with us! But if you like more acid in your bread, this is the different story. 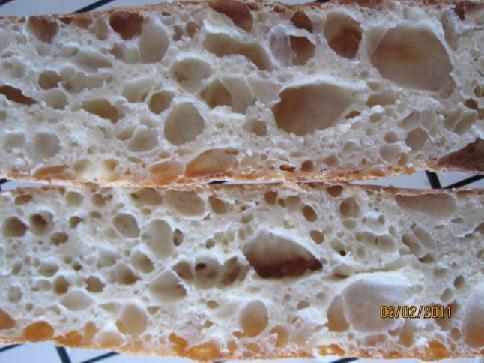 Increasing acidic in a refrigerator is a good thing for people like sour bread. Wow, That is looking wonderful!! 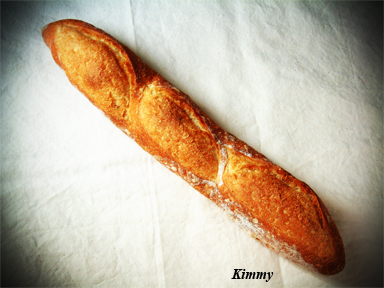 This is absolutely looking great baguette, Kimmy!! 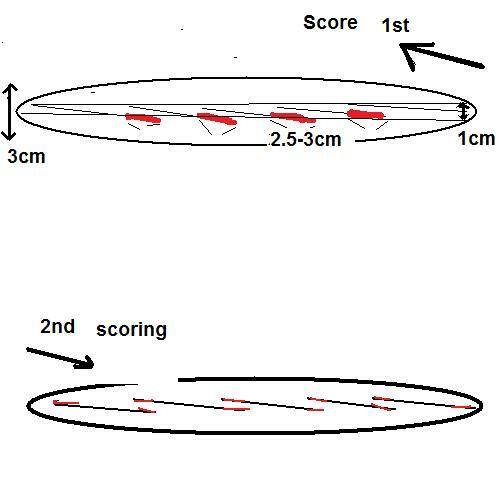 It is also a great job on scoring! 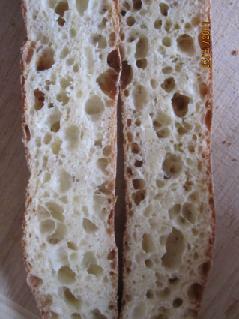 To have nice open crumb like beehives, I am trying to shape very simple way now. 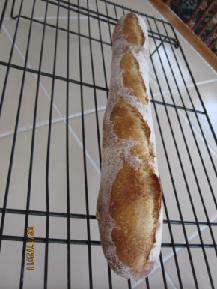 This is Aki's baguette formula but I didn't use a long bulk fermentation at the colder place. Thank you for telling us about your rice wine water! That is very interesting to me. 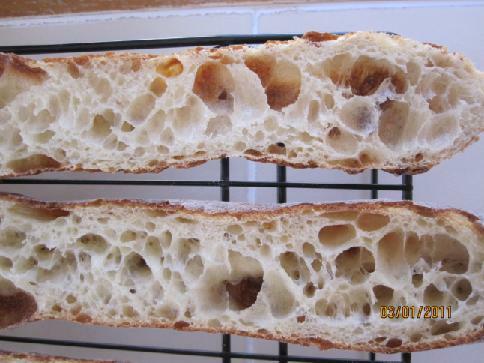 I appreciate your idea to use yeast water for my poolish baguette. I must try it. Thank you for the video! I watched the whole thing even I don't understand what they said. 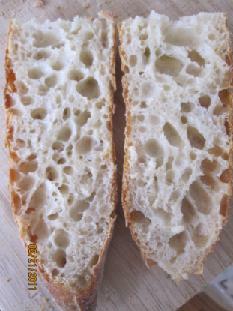 The crumb is amazing, isn't? I have tried to get such a great crumb for more than a couple years.. but I haven't still gotten the one yet, either. I really thank you for your message, which motives me to practice more and more. Now, I am using colder temperature ferment version of it. I checked the dough temperature when I preshaped the dough before... That was around 50-54F.. I don't put the dough below 50F /10℃ ( sometimes the temperature goes down to 46.4F/ 8 ℃ for some reason that I can't control the temperature exactly because I put the dough in a thick bag to keep warm.) I don't refrigerate any dough or retard at the refrigerator directly because I think that the sugar in the dough decrease immediately, which I think from my experiment. 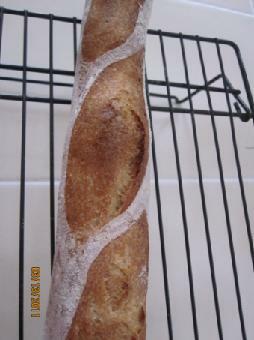 To keep the dough cold that really help me to score easily, and I also think that the crust keeps crunchy. I like both of the baguettes. I hope this help you, and Happy baking!